Do you have teachers that are effectively engaging and encourage a growth mindset in their classrooms? Story telling is one of the most powerful teaching methods that go far beyond literacy and academic achievement. Stories help both teachers and students to explore abstract ideas, complicated topics or even sharing of ideas. The best part is that the simple story book allows students to understand how others experience the world, why things happen, and not only to see but, appreciate different perspectives. Stories help teachers reach young learners in ways they cannot with other deductive teaching strategies. Stories do not just cultivate the joy of reading in the classroom, but have the power to illustrate the most complex and abstract concepts through highs, lows and dramas of their main characters, or the challenges the hero or heroine must overcome. Students learn about social and emotional topics like persevering and learning that mistakes are a part of the process of growth through stories. By telling stories about achievement that resulted from hard work, teachers instill a growth mindset to their young learners through engaging stories. Reasoning and problem solving skills are encouraged through posing thought provoking questions as teachers read aloud to their students. Stories allow young learners a platform to learn about their daily social and emotional challenges and provide a medium for students to think and reflect on their own experiences . The best part is that stories are accessible in any language especially with the ease of the internet. Would you like to empower your teachers to contribute to enhance your school’s academic success, using their passion in teaching and a 21st century formula? 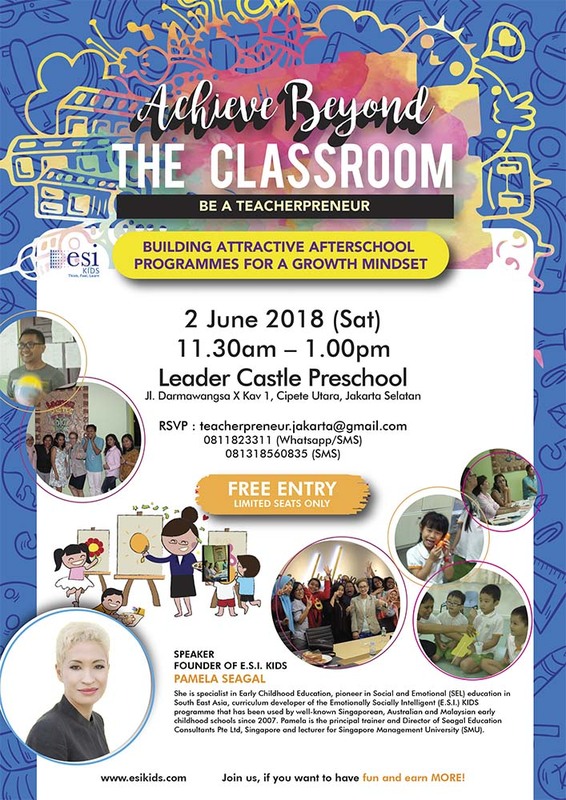 If the answer is yes, let us know your interest by emailing us at teacherpreneur,jakarta@gmail.com or contact us at : +62 811823311 for RSVP.